BOYS BASKETBALL Myles Corey leads the team to a 6-0 undefeated record. Sophomore Blake Davis gathers the rebound and looks for a teammate to pass to in the victory against Montclair, 77-57. 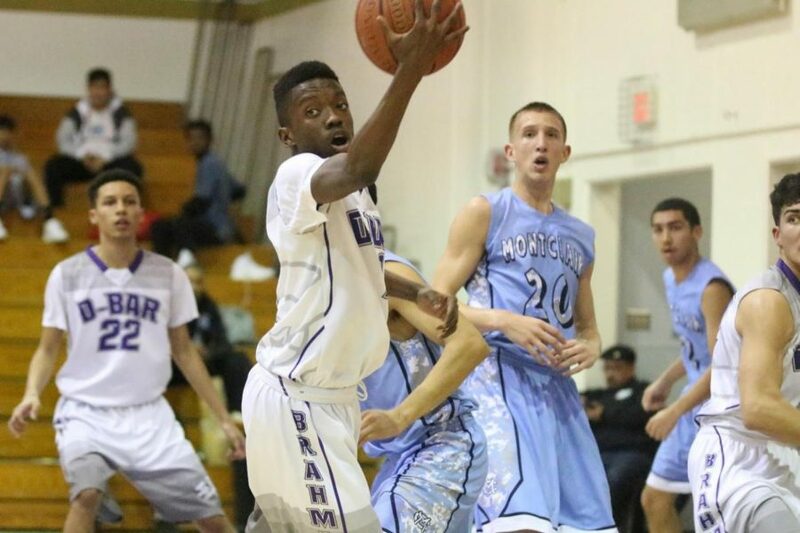 The Diamond Bar High School boys basketball team is tearing up the competition in the Mt. Baldy League, going undefeated while maintaining an overall record of 16-6. “I think we have a really good team and can do well in CIF if we can keep improving. As boring as this may sound, basketball more often than not boils down to fundamentals,” head coach Henry Frierson said. After the break, the boys played several league games against Chaffey, Don Lugo and Montclair for the first time, and Chino and Ontario for the second time. The Brahmas remain undefeated in league with a record of 6-0. All of their league matches were blow-outs for the dominant Brahmas. In the first game back against Chaffey, the team maintained their lead from the first quarter to the final buzzer, winning 69-45. Senior Corey had another amazing night at the home gym, dropping 24 points and 4 steals. Though no one else broke double digit points, senior Bryan Reyes was on the glass the entire night, grabbing 19 rebounds out of the team’s 41. Even though Brahmas outclassed Chaffey, DB couldn’t score efficiently from the field, missing 16 layups and shooting 41.5 percent from the field. In the game against Don Lugo, senior Mike Gao started at center after coming off an ankle sprain during winter break. Corey had a solid shooting night, scoring 36 points and going 50 percent off 12 shots from the three-point line. Though Reyes wasn’t hitting his shots, he contributed to the offense in other ways with 4 assists and 9 offensive rebounds, giving the boys a second chance to score. Senior Justin Herrera had a great defensive game with 5 steals and only 2 fouls. The game ended in a 30 point victory, 74-44. The boys also had no trouble dealing with Montclair to claim first in league for themselves. Both Herrera and Corey had a efficient shooting night, going 100% from beyond the arc and Reyes had a double-double with 14 points and 17 rebounds. Four players in the starting line-up had double digit points: Corey, Herrera, Reyes and senior Amir Hunter. They also performed well on the defensive side of things. Gao had 5 blocks and sophomore Blake Davis had 4 steals. Against Chino, the boys won by 52 points, 94 – 42. Senior Gavin Clements was explosive off the bench, dropping 21 points and 4 assists. Myles, Hunter, and Gao all had double digit points; Reyes collected another 15 rebounds and Herrera had 6 assists. Overall, the Brahmas had very solid showings against all league opponents, winning all of their games by 20 points or more. Though the Brahmas are faring well in tournaments, winning two out of the four they played in, Frierson still isn’t satisfied enough with the team’s performance. He expects the boys to be winning all tournaments they participate in. According to Maxpreps, the team is in the Top five for most points scored for in the season in California’s 2A division. However, Frierson wants the team to improve in other ways aside from their offensive capabilities. “Rebounding and setting good screens have been issues for us trying to address,” Frierson said. With Gao back in the line-up and the team ready for CIF, Frierson has high hopes for the team to achieve a Top eight status in their division, which includes teams from across Southern California. “We can easily be a better team. We just have to make our shots, and play our brand of basketball,” Gao said.